One of the reasons that I knew this would be an exceptionally awesome birthday weekend is that I was anticipating the arrival of a very special visitor. A few months back Lisa found a really cheap deal on a flight to NYC for my birthday weekend and decided to snap it up! Lisa has never in New York at Christmastime and nobody does the holidays quite like we do here. This meant my excitement was twofold. Not only do I get to have one of my close friends here for my birthday weekend (and meet my boyfriend! ), I also get to show her the place I love best in the world; New York City at Christmastime. My day off yesterday was spent mostly running errands (though some were fun like getting my hair done) and a bit of cooking. 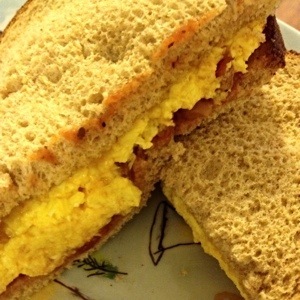 For lunch I treated myself to one of my favorite things, an egg sandwich. I scrambled an egg with some milk and cheddar cheese and are it on whole wheat toast with a little salsa. So simple, but so delicious. Lisa arrived just in time for dinner. Since neither if us were planning on drinking last night, but we were in a festive mood, I decided to make us some mocktails. I shook orange juice, pineapple juice and some of the liquid from a jar of pickled jalapeños over ice then strained the mixture in to salt rimmed glasses and floated a little seltzer on top. They were good though Lisa and I agreed that they could have been spicier. I know that Lisa loves Mexican food so I decided to make fajitas and serve them with corn tortillas since she’s gluten free. 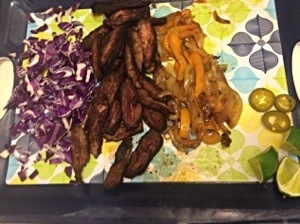 I marinated skirt steak in olive oil, fresh lime juice, cinnamon, cumin, coriander, unsweetened cocoa powder, garlic, salt and pepper and then cooked the meat to a nice medium rare. I served the steak with sautéed peppers and onions, red cabbage for crunch, pickled jalapeños, lime wedges, sour cream and, of course, those corn tortillas. I served all of this lined up on a tray and was so proud of how pretty it looked, but then I forgot to take a picture until we’d eaten and I was putting the leftovers away. Birthday weekend day two was another great one and I can’t wait to take Lisa on her first NYC holiday adventure today! What a fun weekend of wonderful! It’s always so exciting to have a friend come visit who has never seen your city before and to be a tour guide… and it’s even better that you got to do this on your birthday weekend! I hope y’all continue having fun… and your dinner looks fabulous! YUM! 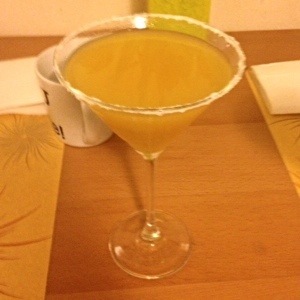 Well I can vouch for the fact that the meal was delicious and I loved the mocktail! I would definitely make something like that again. Mexican is one of my favorite cuisines so it was a great way to start off the weekend of awesomeness! !